I am not a wine connoisseur but I do enjoy drinking wine every once in a while. I've been to different wine tasting events and I've considerably purchased and tried different brands, regions and types of wine. I got to admit it wasn't love at first sip but after learning the basic intricacies of wine, I started to appreciate until I fell in love with it. There is one wine bar that I've frequented and will always go back to...Wine story in Shangri La Mall. With a tagline 'Tasting by the glass, before you buy', the place doubles as a wine store and a wine bar. It has an Enomatic Wine Dispenser installed, the system is a cool and clever dispensing machine that preserves the taste and quality of wine for weeks. It also serves the wine in its best possible condition. The store changes the wine lay out every two weeks. 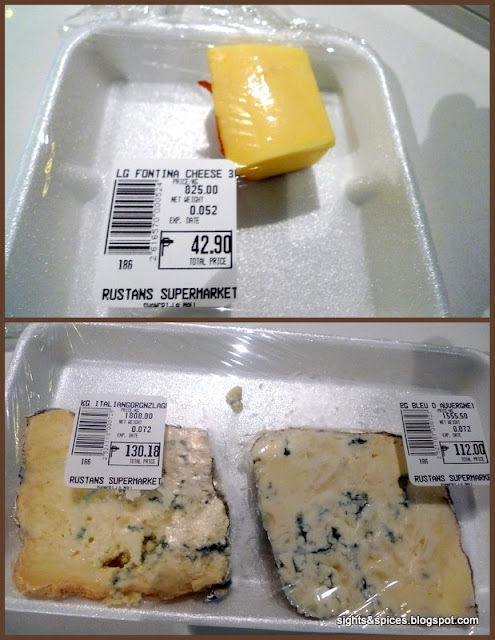 Before going there, one might want to consider buying cheese from Rustan's Supermarket. Cheese is always an excellent companion for wine. Bread sticks are always given for free and you can ask for refills. Before, one can order food from any restaurant within the mall without any minimum purchase but as of the moment you have to purchase a whole bottle of wine before you can order food. The tasting area is pretty small, there were only two tall tables and eight bar stools per table. Although small, it has a very cozy and comfortable ambiance that I really liked. On the side of the tables are three banners with titles: The Etiquette of Wine, Wine Tasting 101 and 18 Wine Styles. Putting the banners on the side is a really nice and smart thing to do. As one enters, you'll be given a card, you can either choose to pre-load it with a certain amount or you can just pay for what you consumed later. After getting the card, this is where the fun part begins. After choosing the wine you like, put in the card in the slot and choose from either a tasting portion, half a glass or full glass. Below each wine bottle are its corresponding brand, wine score, region, price and wine notes. Afterwards, you can proceed to look, swirl, sniff and sip. On the dispensing machine there is a lighted ledge where you can check the wine's characteristics and age. More often than not, the darker the color of the wine, the more intense the flavors. As for age, the lighter the color, the older the wine is. "Which is the Older Wine?" I strongly suggest that after swirling the wine to let it sit first for a couple of minutes before proceeding to sniff and sip. In doing so, the alcoholic smell and taste evaporates which will lead one to enjoy the aroma and taste better. I always enjoy going to Wine Story because this is where I'll get to try out superb high-scoring wines and most importantly it's a place where I know I'll learn more about the intricacies of wine. The sommeliers who works there are very knowledgeable and are always willing to share their insights. There was also a couple of times where I got to talk with random fellow wine-enthusiasts and even got to chat with a wine maker who was sharing the same table. We are more of a beer drinking nation but I strongly think that more and more people are getting into wine. Foodies nowadays are so knowledgeable about what good food is and I'm pretty sure learning about wines is the next big step. As we all know good wine will always compliment good food, wine brings out wonderful flavors in food and vice versa. I wish to greet everyone a Very Merry Christmas and Prosperous Happy New Year!!!! Cheers!! !